Now that spring is officially here, Easter is waiting right around the corner. It’s a great time of year to celebrate friends, family, and the return of warm weather. 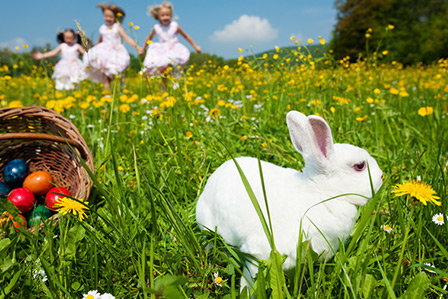 If you’re looking to enjoy Easter Long Island style, you’re in luck - there are a ton of springtime events going on that are great for everyone! We here at Westbury Toyota have made up a quick list of five events we think look to be the most fun, so keep reading and get ready to mark the dates on your calendar! If this event sounds like the perfect holiday celebration for your family, be sure to save the date! The fee is $12.00 per person (or $10.00 for those who are museum members). What better way for your family to enjoy Easter than to have breakfast with the Easter Bunny himself? If this sounds ideal, you’ll want to be at Dave & Buster’s in Islandia on April 20th. You’ll be able to partake in a delicious breakfast buffet with all the food you could ever want. Afterward, the Easter Bunny will be taking pictures with anyone who wants one, so be sure to bring your phones or cameras. If you’re looking to make a day out of it, buying a $10.00 Power Card will give the holder Unlimited Game Play all day long! The admission fee is $23.57 per person, tax and gratuity included. The Long Island Aquarium is offering up an impressive Easter Brunch with seatings at 10:00 A.M., 12:00 P.M.. or 2:00 P.M. Afterward, the entire family can participate in a Penguin Egg Hunt that runs from 10:00 A.M. to 3:00 P.M. Brunch will take place in the beautiful Sea Star Ballroom and there will also be a craft station for kids to make Easter-themed crafts. The Easter Bunny will also be making an appearance to take photos with anyone who wants one. Admission to the aquarium is included in the event price, which means that you and your family can check out the Bugs, Butterflies & Birds exhibit, as well! Reservations are required for this event, so be sure to call today and book yours. This event takes place on Easter (April 21st) in Port Jefferson. The walking parade is open for everyone to participate in, as long as you wear an Easter bonnet (or some other kind of Easter-themed apparel). The parade begins at noon with the egg hunt following soon after at 12:30 P.M. There’s no admission charge and all children will receive a free Easter treat! The Sweetbriar Nature Center in Smithtown has a full day of fun activities planned on April 20th. There will be numerous egg hunts taking place throughout the day, as well as crafts, live animal presentations, face-painting, and more! It wouldn’t be a spring celebration without the guest of honor, which is why the Easter Bunny will also be making an appearance. Be sure to check this out if you’re looking for a busy day of fun to celebrate Easter and spring! As you can see, there’s no shortage of local Easter Events this year, so make sure to check out a couple with your family! We think the ones listed above look pretty neat and we hope you do too!